Call to request this custom tour itinerary for your group! Join us this spring for an unforgettable spiritual journey through Greece. 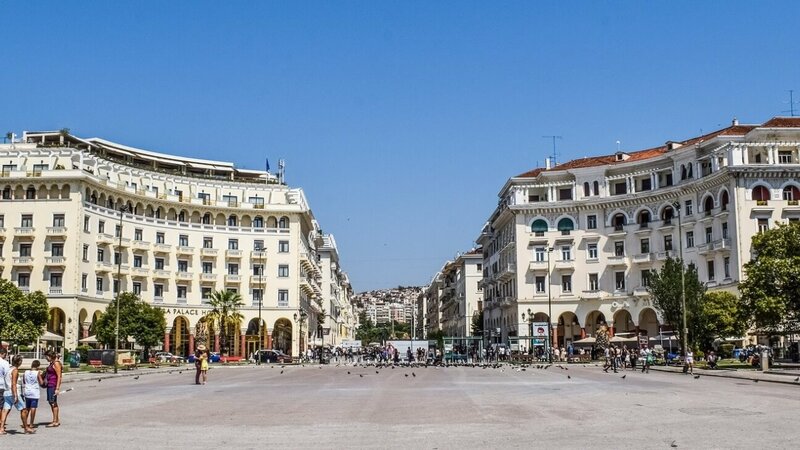 This air-inclusive tour begins in Thessaloniki, Greece and you'll enjoy 4 star hotels and breakfast and dinner throughout your tour. Visit Philippi, where Saint Paul the Apostle delivered his first sermon and established the first church in Europe. You'll see the ruins of the prison Paul and Silas were thrown into by the owners of the fortune-tellers. 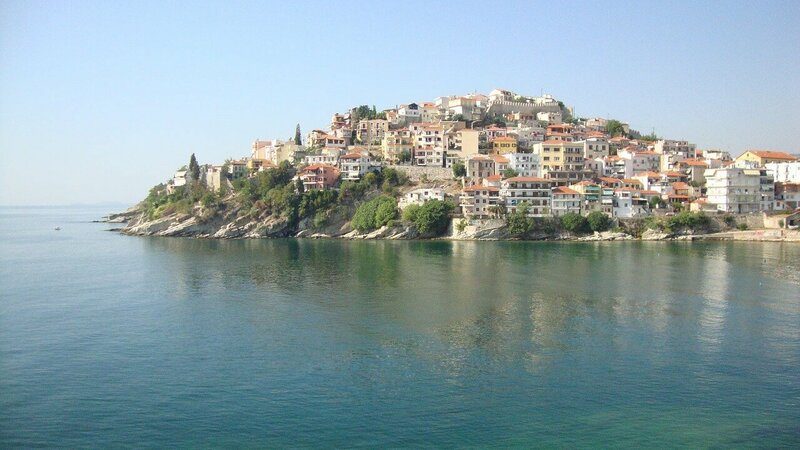 Continue to the modern port city of Kavala, which was once the ancient Neapolis. This port is where Saint Paul, Silas, Luke and Timothy landed when they sailed into Europe. After enjoying this city by the sea and another overnight in Thessaoniki, witness ancient artifacts, such as the triumphal Arch of Galerius that is found at the start of Via Egnatia. Following your city tour, transfer to Kalambaka. 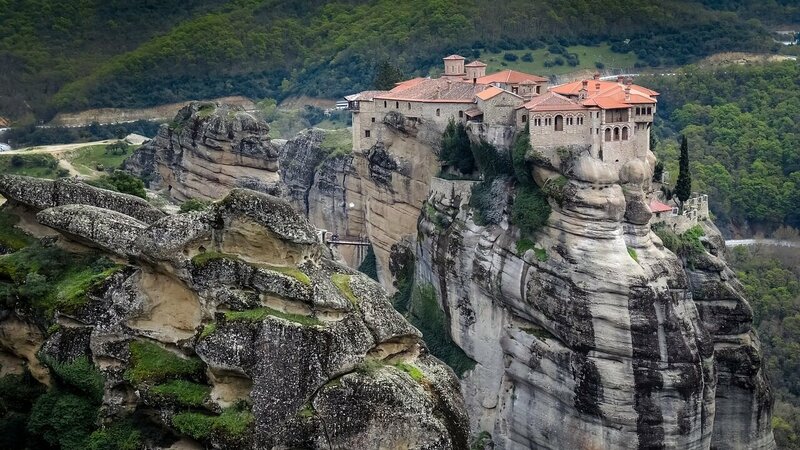 View stunning Byzantine art, as well as the breathtaking scenery that surrounds the Meteora Monasteries and continue your journey to Delphi - the center of the ancient world (navel) of the earth. On the slopes of Mount Parnassus, in a landscape of unparalleled beauty and majesty, lie the ruins of the Sanctuary of Apollo Phthios. Visit the site and the museum and continue to Athens. “Men of Athens, I perceive that in every way you are religious. For as I passed along and observed the objects of your worship, I found also an altar with this inscription “to an unknown God”. What therefore you worship as unknown, this I proclaim to you...”. 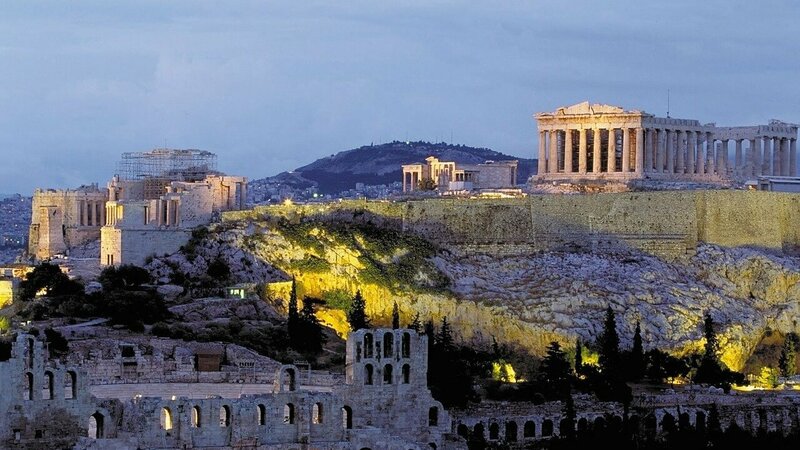 Visit the rock that has dominated the panorama of Athens for twenty-five centuries, the Acropolis. At the Acropolis, you will see the ruins of the Parthenon, Erectheum, and Propylae. After, you will ascend Mars Hill of where Saint Paul spoke to the Athenians. At this site, Paul spoke to the Athenians about the one and only God (Acts 17:22). You will have the opportunity to view the University of Athens, and visit Panathenaic Stadium, before you proceed to the ancient Corinth. Under the shadow of the towering Acropolis, Saint Paul lived in Corinth for two years. While here, Saint Paul felt great grief over the way that the Gentile Church in Corinth has become. As a result, he was prompted to write four letters, all with the overarching theme of love. 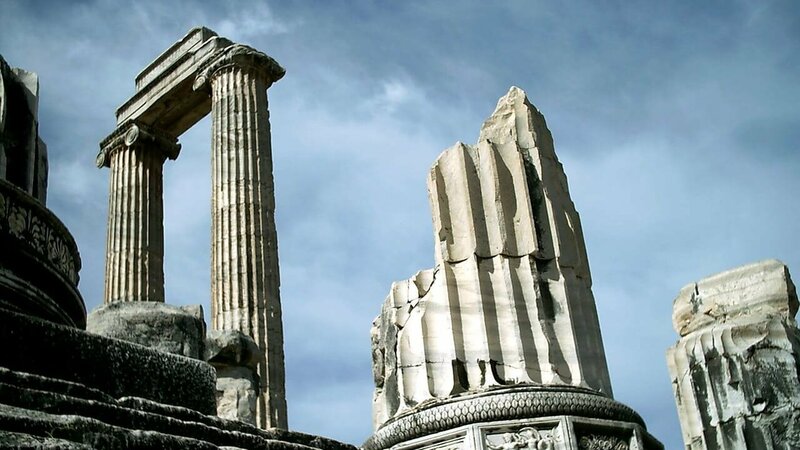 In Corinth, you will have the opportunity to view the remains of the first century shops, the site of Saint Paul's trial by Gallio, the Fountain of Peirene, and the Temple of Apollo. Following your visit to Corinth, return to Athens for a delicious meal and overnight. After your journey by land with Paul, you have the option of extending your stay to the waters with a 3-day cruise that features stops at: Mykonos (Greece), Kusadasi (Turkey), Patmos (Greece), Heraklion, Crete (Greece), Santorini (Greece) and returning to port at Piraeus for a post-night in Athens before you travel home. Depart Dallas (DFW) airport on your overnight flight to Europe. After breakfast start your journey in Greece with the first stop of the day in Philippi. Philippi was the city to where Saint Paul the Apostle delivered his first sermon and where he established the first church in Europe. "And from there (He went) to Philippi, which is the leading city of the district of Macedonia and a Roman Colony. We remained in this city some days..." (Acts 16:12-18). Also, it is the site of where Saint Paul baptized a woman named Lydia, the first convert to Christianity in Europe. Visit the Roman Forum where Saint Paul cast a spirit out of a fortune-telling woman. While here, you will have the opportunity to view the prison (now in ruins) where Saint Paul and Silas were thrown into by the owners of the fortune-tellers. Continue to the modern port city of Kavala, which was once the ancient Neapolis. This port is where Saint Paul, Silas, Luke and Timothy landed when they sailed into Europe. After enjoying this city by the sea, return to Thessaloniki for a delicious meal and restful overnight. Start the day with breakfast at the hotel. In the winter of 49-50 A.D., Saint Paul wrote two epistles to the Thessalonians. These letters urged Christians to "live blamelessly" and to refrain from living idly while they wait for the second coming of Christ. 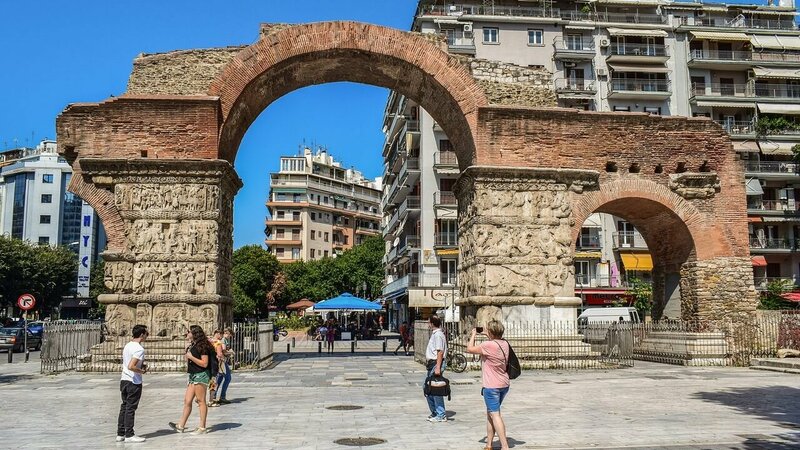 While in Thessaloniki, you will witness a number of ancient artifacts, such as the triumphal Arch of Galerius that is found at the start of Via Egnatia. Due to the convenient location, this arch was once a strategic artery of the Roman Empire. It was originally constructed in order to honor the Roman Emperor Galerius following the Roman victory over the Persians. Following your city tour, transfer to Kalambaka. This evening, you will have a wonderful meal and a relaxing overnight in Kalambaka. 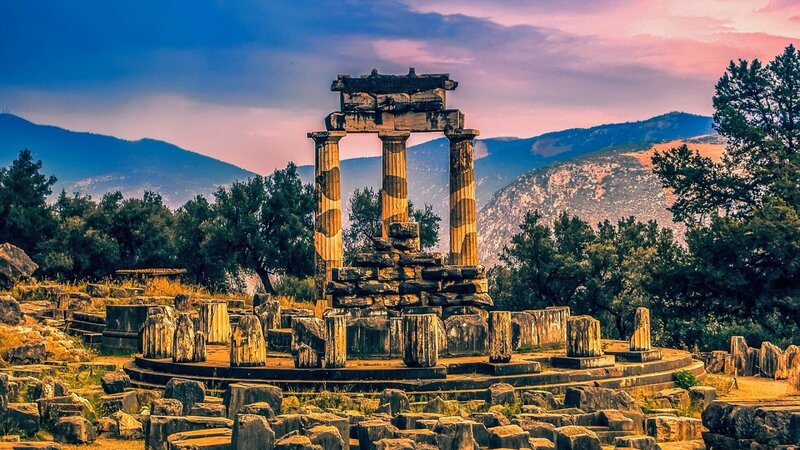 Visit Delphi, the center of the ancient world (navel) of the earth, whose prestige extended far beyond the boundaries of the Hellenic world. On the slopes of Mount Parnassus, in a landscape of unparalleled beauty and majesty, lie the ruins of the Sanctuary of Apollo Phthios. Visit the site and the museum and continue to Athens.“ Men of Athens, I perceive that in every way you are religious. For as I passed along and observed the objects of your worship, I found also an altar with this inscription “ to an unknown God”. What therefore you worship as unknown, this I proclaim to you...”. Athens, is one of the most glorious cities in the world and the cradle of western civilization as we know it today. Dinner and overnight at our hotel. After a nice breakfast at the hotel we will start with a tour of the oldest city in the world, Athens! Visit the rock that has dominated the panorama of Athens for twenty-five centuries, the Acropolis. At the Acropolis, you will see the ruins of the Parthenon, Erectheum, and Propylae. After, you will ascend Mars Hill where Saint Paul spoke to the Athenians. At this site, Paul spoke to the Athenians about the one and only God (Acts 17:22). While in this city, you will be able to view the ancient Agora, the former public center of Athenian life. It held the focus of a political, commercial, social, religious, and cultural center. As you are in the former political center, proceed for a drive through the city to view the House of Parliament on Syntagma Square. Also, you will have the opportunity to view the University of Athens, the oldest higher education institute in Greece, as well as, the National Library of Greece that holds 4,500 Greek manuscripts. Then, visit Panathenaic Stadium, the beautifully marbled multi-purpose stadium. It is home to the Olympian Zeus, and is the site of the first modern era Olympics (1896). Following your visit in Athens, you will proceed to the ancient Corinth. Under the shadow of the towering Acropolis, Saint Paul lived in Corinth for two years. While here, Saint Paul felt great grief over the way that the Gentile Church in Corinth has become. As a result, he was prompted to write four letters, all with the overarching theme of love. In Corinth, you will have the opportunity to view the remains of the first century shops, the site of Saint Paul's trial by Gallio, the Fountain of Peirene, and the Temple of Apollo. Following your visit to Corinth, return to Athens for a delicious meal and overnight. Your guide / driver will meet you at your hotel and you will be transferred to the Athens airport for your return flight(s) home. Alternatively, extend your stay in Greece with a 3-day cruise. Today marks the end of your cruise. Following disembarkation you will be transferred to an Athens hotel for a leisurely post-night before your return home. You will have an early morning transfer to the Athen's airport to begin your journey home. Your flight lands at DFW on the same day. Tipping or Gratuities for drivers and tour guides is always appreciated and not included in the tour package. Transportation to/from DFW airport is not included. Call to inquire about sedan service or a group transfer. *Booking Discount: Make your final payment by check prior to the final payment due date and receive a $200 per couple/ $100 per person booking discount! Optional Travel Insurance is available and should be purchased and paid for at time of deposit. Travel Documents: Final documents for all passengers paid in full will be mailed approximately 10 days prior to departure. Itinerary and air schedule is subject to change. In the unfortunate event that an activity or hotel is no longer available, we will substitute a similar activity or hotel. NOTE: Due to airline security measures, your passport name must match your airline ticket name and your tour reservation name or you may be denied aircraft boarding. Booking Changes: Any changes/revisions made to a confirmed/ticketed reservation may be assessed a change/administration fee as a result of travel supplier and airline change fees. Deposit: This tour requires a $250 deposit per person following reservation with final payment due 100 days prior to the date of the trip. Reservations will not be confirmed without payment or deposit. Payment Methods: Reservations may be made online at www.premiertoursglobal.com or by calling the office of Premier Tours Global at 888-407-2772. Premier Tours Global accepts, Visa, MasterCard, Discover and American Express. Check payments should be mailed to Premier Tours Global 4525 Production Drive, Dallas, TX 75235. Tour Cancellation: Premier Tours Global reserves the right to cancel any tour due to lack of interest or participation. In the event of cancellation by Premier Tours Global your deposit will be refunded. Customer Cancellation: Refunds for customer cancellations will be made in full if canceled at least 100 days before departure. On cancellations less than 100 days, Premier Tours Global reserves the right to assess a fee for those non-refundable items of the trip and retain your booking deposit. The tour is non-refundable if cancelled within 75 days of travel. Travel insurance is highly recommended.